Ross County skipper Marcus Fraser is back in action. Ross County hope skipper Marcus Fraser will return to full training next week after suffering a setback in his recovery from injury. 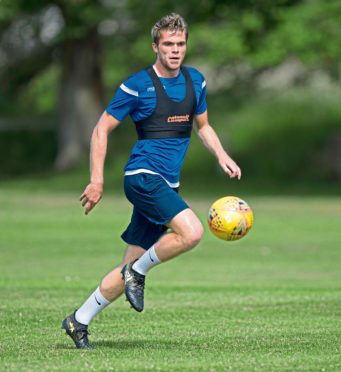 Defender Fraser has been sidelined since the 3-2 Betfred Cup defeat against Hibernian on August 19, with initial tests identifying a calf problem. Further scans have revealed a minor fracture in Fraser’s shin however, which has delayed the 24-year-old’s return to action. Although Fraser will miss Saturday’s Championship trip to Dundee United, Staggies co-manager Stuart Kettlewell is hopeful he will not face much longer on the sidelines. Kettlewell said: “We feel as if we’re starting to get there with Marcus. There was a bit of setback last week, but over the last few days we have probably got a lot closer to getting to the bottom of the problem. “It look as if he’s had a slight fracture around his shin. It doesn’t change the recovery period or how we managed the recovery. “It was something that didn’t show up when the original scan and x-ray was carried out. “A bit more information came through earlier this week, and we would be hopeful we can maybe push him back into full training next week. Kettlewell was disappointed by the Staggies’ Highland derby display against rivals Caley Thistle on Saturday, as the Dingwall side recorded a second successive 0-0 draw following a stalemate with Queen of the South the previous week. Kettlewell is searching for an improvement in Saturday’s trip to Tannadice, and he added: “I could stand here and say we’ve recruited so many players and are looking for that bedding in process to complete, but we are not. We’ve seen more than a flash of that up to this point in the season. “We know we have a good group of players and we know there will be times it clicks and stages where we’ll be looking for more from them. That’s the nature of football. Show me a team where that’s not the case. “We’ve had a decent start and we’ve played two free-scoring teams and not lost those games. “That might sound like a slightly defeatist mentality, of course we wanted three points from those games, and we genuinely believe had we got close to our levels we might have done so.